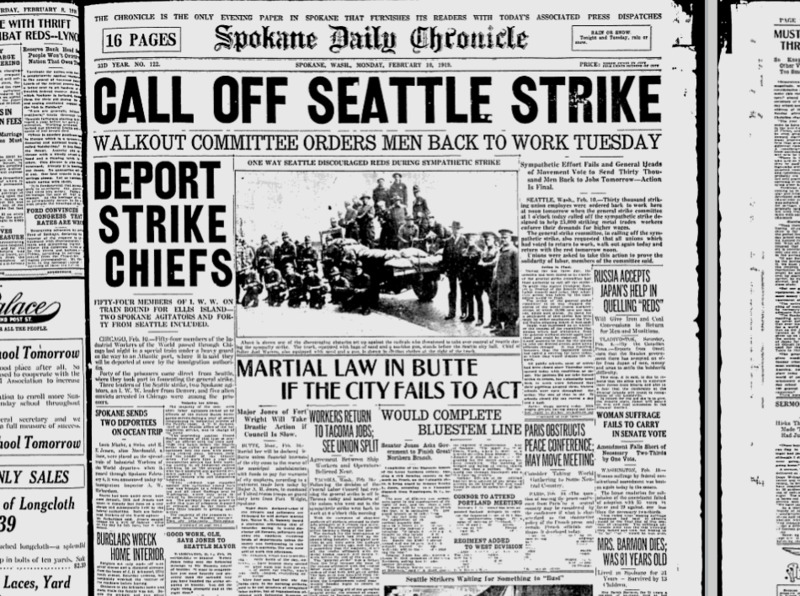 The Seattle General Strike of 1919 was over. The general strike committee called off the sympathetic strike of 30,000 union members and ordered them to return to work the next day. The general strike had lasted less than a week, doomed by defections and the disruption it had caused to the city. Meanwhile, 25,000 shipyard workers were still on strike. The general strike had originally been called in support of the shipyard workers in the Metal Trades Union. That strike appeared to be no closer to settlement. From the burglary beat: Two Spokane police detectives hid in the cloakroom of Central Methodist Episcopal Church during choir practice. About 30 minutes into the stakeout, the detectives saw what they were waiting for: A boy opening a window and rifling through the coats and purses. They burst from their hiding places and caught Owen Hathaway, 12. The detectives had staked out the room following complaints from choir members about missing money over the previous several weeks. The boy had climbed up to the window on a pole. He implicated two other boys, 13 and 14, as his accomplices in the previous thefts. Police arrested all three on burglary charges. Published: Feb. 10, 2019, 4 a.m.